Winter is coming. While you may not have to worry about white walkers, you do have to worry about a blanket of snow and ice that can make the roads more dangerous and turn your yard into a slushy mess. The cold weather will also do a number on your home, spiking your energy bills and causing water damage in places. Wooden windows will warp with exposure to water and extreme temperature changes over time. The frame loses its seal and allows water to seep inside, rotting the wood and drywall around the window and spreading mold and mildew. 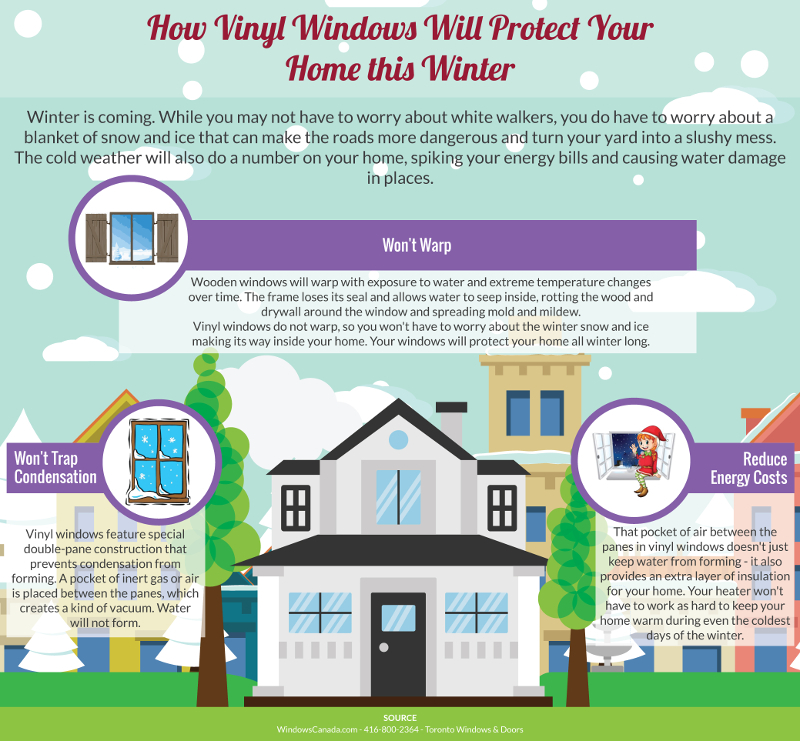 Vinyl windows do not warp, so you won't have to worry about the winter snow and ice making its way inside your home. Your windows will protect your home all winter long. Condensation can form between the panes of many types of windows. The condensation can combine, forming water drops that seep into the frame and the material of your house. Water can cause rotting and mold. However, vinyl windows feature special double-pane construction that prevents condensation from forming. A pocket of inert gas or air is placed between the panes, which creates a kind of vacuum. Water will not form. That pocket of air between the panes in vinyl windows doesn't just keep water from forming - it also provides an extra layer of insulation for your home. Your heater won't have to work as hard to keep your home warm during even the coldest days of the winter. You'll save money and do your part for the environment at the same time. The insulating properties of the vinyl windows also work during the summer, helping you to reduce the strain on your air conditioner and save on energy costs.